2 + pieces $39.50 ea. FREE SHIPPING FOR Genuine Doulton Ultracarb Replacements for Doulton Counter top (HCP) unit, the Doulton undercounter (HIP) unit, and other products that utilize a thread mount candle type cartridge. Also called CU1200 and DUC-1000, this filter fits the HIP, HCP, HIS, HCS, IP100-300UC, CP100-300UC models. Doulton part number W9123053. WHAT IS AN ULTRACARB CERAMIC FILTER CARTRIDGE? 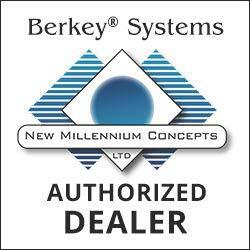 The Sterasyl ceramic is fitted with both an activated carbon block and an ion exchange resin insert to produce the Ultracarb. Among other things, activated carbon is very effective at removing chlorine and organics from water. The ion exchange resin specifically removes lead from water. Ultracarb is designed to be used in pressure filters (on a mains water supply), not in gravity filters. 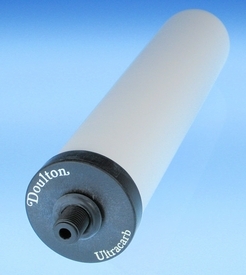 CLICK HERE FOR MORE INFORMATION ABOUT DOULTON ULTRACARBS Doulton undercounter (HIP) unit, and other products that utilize a thread mount candle type cartridge.